Scientists, engineers, and architects from all over the world are lining up behind the "911 Truth Movement". They have analyzed the circumstances surrounding the 911 disaster and have concluded that the series of events could not have happened simply by two jetliners hitting the World Trade Center towers, One and Two. A well reasoned Documentary has been produced (and widely distributed) which presents a critical analysis of the 911 sequence of events and presents many questions about the events. This "Truth Movement" has concluded that the implosion of the three towers had to be due to a conspiracy -- probably led by elements within the US Government. 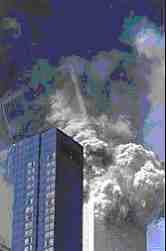 The collective consensus of the "Truth Movement" supports the theory that the virtually perfect implosions of the three buildings had to be the result of Controlled Demolition, such as placed explosives in multiple locations of every floor of the three buildings. But the "Controlled Demolition" theory makes no sense. It is virtually impossible to conceive of members of the US government (or any other group of mortals) being able to secretly plan and execute such a Controlled Demolition of the three buildings. Even then, such perfect implosions which happened at "free fall" speeds are impossibe to explain from an engineering analysis standpoint. And the buildings were pulverized -- where did the engrgy come from to turn all three buildings and their office contents to Dust? The implosions happened as a result of ET/UFO intervention. Here are some ET Corn Gods language translations which support this hypothesis. The third building (WTC 7) fell at 520 in the afternoon. The numbers 520 convert to "ET" ("E" is letter "5", "T" is letter "20"). The Pentagon was hit at 9:37, a number which converts to "UFO ET" (9+66+66 ... = "UFO". 37 is 73, backwards, 73+66+66 = "205", "TE", backwards is "ET"). The word "Implosion" converts to the words "ET UFO Plop" and "911 Plop". It should be noted that each of the three building "Plopped" at free fall speeds into their own "footprints". The building sequence "127" converts to the date "Dec 7", the date "Pearl Harbor" was attacked by the Japanese. The words "Pearl Harbor" converts to the phrase "Per ET UFO 911" or "War ET UFO 911". The UFO/ET's often communicate with humans using dates/times and the names of the places that events occur. George R Simpson was assaulted in St Thomas, US Virgin Islands on March 18, '05. His wife was assaulted on September 13, 2005 -- the work "Crime" expressed in numbers is "3(c) 18(r) 9(i) 13(m) 5(e)" -- the exact dates of the two assaults. The word "Roswell" converts to the word "UFO's Wow". © Corn Gods Publishing Company, Inc., 1996-2008, Hampton Bays, NY, All rights reserved.